BBC – Is back pain hurting the UK economy? CSP – Fit enough for patients? Musculoskeletal disorders are the second biggest cause of work-limiting health problems and sickness absence in the UK. Evidence shows that people with MSDs want to work but require more help and support to make this possible. You will find here a range of information to help overcome the complications experienced by people working with arthritis or a musculoskeletal condition. It also highlights some examples of good practice by employers, and sets out a series of recommendations to address the needs of people with musculoskeletal conditions who want to work. The report is intended for policy makers, healthcare professionals, employers, academics, and individuals with an interest in health and work. The Workplace Wellbeing Charter is an opportunity for employers to demonstrate their commitment to the health and well-being of their workforce. The positive impact that employment can have on health and wellbeing is now well documented. There is also strong evidence to show how having a healthy workforce can reduce sickness absence, lower staff turnover and boost productivity – this is good for employers, workers and the wider economy. Read more from the Wellbeing Charter website. MSK conditions represent a huge cost to the economy in terms of lost working days and employment support. This charter recommends positive steps to be made by policymakers, employers, healthcare providers – all stakeholders – to recognise the importance of helping the people whose lives are affected by MSDs return to work and retain employment. LUPUS UK provides free information for employees and employers on managing lupus at work. This page provides booklets for people with lupus and information for employers to better support people with lupus to remain in or return to work. The booklets contain advice about work support schemes, adapting to work with lupus, and tackling problems in the workplace. NICE has produced guidance on ‘workplaces’ including’ managing long-term sickness and incapacity to work’, ‘promoting physical activity in the work place’ and ‘workplace policy and management practices to improve the health and wellbeing of employees’. See Workplace guidance from NICE. Update, June 2015 – NICE calls for employers and managers to do more to address the effect that poor working environments on people’s lives: “Promoting a culture that improves the health and wellbeing of employees is good management and leads to healthy and productive workplaces”. This study by the Work Foundation and the Fit for Work Coalition considers the self-management of chronic musculoskeletal disorders (MSDs) in the workplace, contributing to our understanding of self-management and work. Self-management can be defined as an individual’s ability to manage the symptoms, treatment, physical, social and psychological consequences of living with a chronic condition. The Fit for Work UK Coalition (part of fitforworkeurope.eu) brings together healthcare professionals, policy makers, employers, and patients to improve the productivity of Britain’s workforce, by empowering and supporting people, including those with long-term conditions, to remain in or return to work and be economically active. Read their report Is the UK Fit for Work? 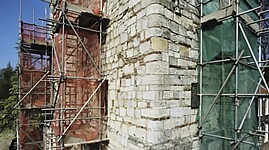 – Confronting the challenge of UK workforce health or visit the Fit for Work UK Coalition website. New return-to-work service goes live to help GPs, employees and employers across England. “GPs throughout England and Wales can now refer employed patients who have been, or are likely to be, off sick from work for four weeks or more for a voluntary occupational health assessment. Read the Press Release, 22 July 2015, or visit their website for free, expert and impartial work-related health to all. The Work Foundation are an academic, research organisation that transforms people’s experience of work and the labour market through high quality applied research that empowers individuals and influences public policies and organisational practices. Their Reports page holds scores of socio-economic and workforce effectiveness studies, including the Self-management of Chronic Musculoskeletal Disorders (featured above) which they co-authored. In February 2014, the BBC Business desk reported on sickness absence in the labour market, citing research published by the Office for National Statistics. The ONS Labour Force Survey highlights the enormous impact of MSK disorders on work, and by extension the UK economy. The ONS study found that musculoskeletal conditions accounted for more prolonged absences than any other ailment. Arthritis Care’s booklet ‘Working with Arthritis’ is a useful resource for anyone with arthritis who is starting work for the first time, staying in employment or returning to work. It can be downloaded here or ordered here. There is also lots of information for people with arthritis on Arthritis Care’s website. 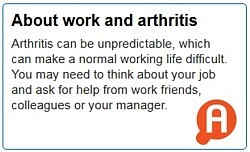 On their Work and Arthritis page, Arthritis Research UK provides help answering these questions: What problems can arthritis cause at work? What can I do to help myself at work? Who can I talk to about work and arthritis? How can my colleagues or employer help? How can the Government help me at work? Should I keep working? The National Rheumatoid Arthritis Society has compiled their reports and articles pertaining to RA and work into this NRAS resource page. It features the I Want to Work booklet, and many other useful documents, including: Overcoming problems at work; When an Employee has Rheumatoid Arthritis; Ill Health Retirement information; European Fit for Work report; RA and Work – NRAS Scottish Work Survey 2010. NASS provides free information for employees and employers on managing Ankylosing Spondylitis at work. This page outlines your rights as an employee under the Equality Act 2010, and you can download a guide to staying fit in the workplace. Employers’ guide to AS document in PDF. NASS is also able to provide advice and support to both employees and employers via their helpline. The Boorman Review set a clear goal for the NHS – improve the care of staff to improve the care for patients, identifying potential “savings for the NHS of £555 million a year if sickness absence among staff was tackled with early intervention occupational health services, such as physiotherapy.” In March 2013 the Chartered Society of Physiotherapy published an audit of workplace health and wellbeing services for NHS staff. More than a third of the responding trusts admitted to not having a health and wellbeing strategy in place. Visit their website to read a summary of the findings and the CSP’s plans for improving the health and wellbeing of staff, or open the report directly by clicking the Fit Enough for Patients? icon. This Working for Health booklet from the COT describes and illustrates occupational therapy in vocational rehabilitation. It highlights how you, your service or organisation and your clients and customers will benefit from occupational therapy. The costs of ill-health in the working age population are not only borne by the health, social and welfare systems, but also in terms of national productivity, and by individuals and their families. Poor employment outcomes for people with long-term health conditions contradicts the fact that many people with such conditions are able and motivated to work – what is lacking is the right support to enable them to do so. 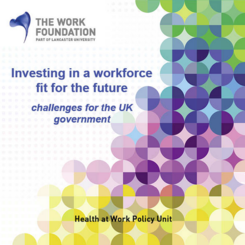 This report from the Work Foundation sets out the workforce health policy challenge to government. Sheffield Aches and Pains provides advice and information that can enable some people living with MSK disorders to carry out their usual day-to-day activities. There is also an advice page specifically designed for employers who want to support their staff at work, off work or returning to work. Read more from the Sheffield Aches and Pains website. Sheffield Aches and Pains Advice for Employers.